The Huskies finish fourth in the Division III national tournament. 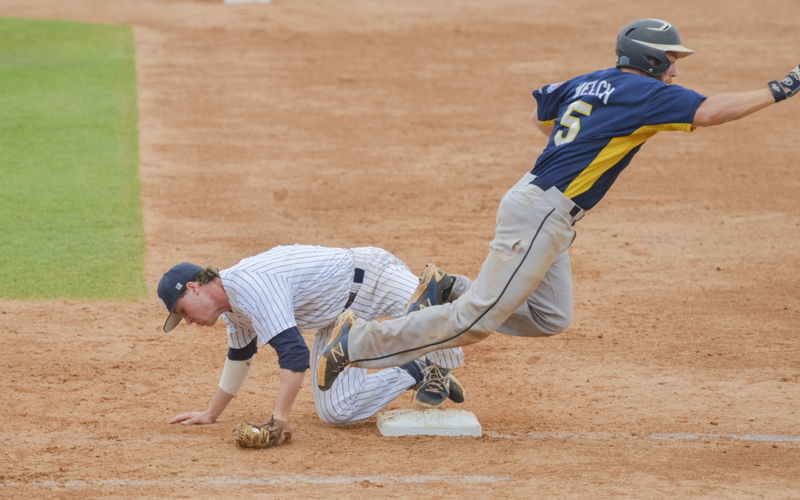 APPLETON, Wis. — Such is the game of baseball that a team can lose by 12 runs, but still point to a play in the early innings of the game as the difference. 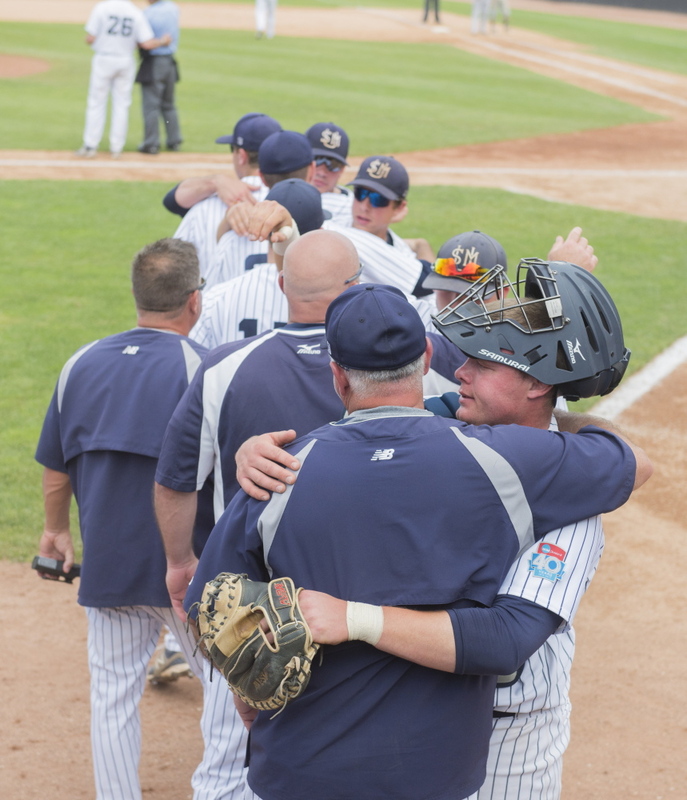 The University of Southern Maine was eliminated from the NCAA Division III national baseball championship tournament Monday afternoon by Emory University, the Huskies’ season crashing down in a 15-3 loss at Fox Cities Stadium. USM finished fourth in the tournament. 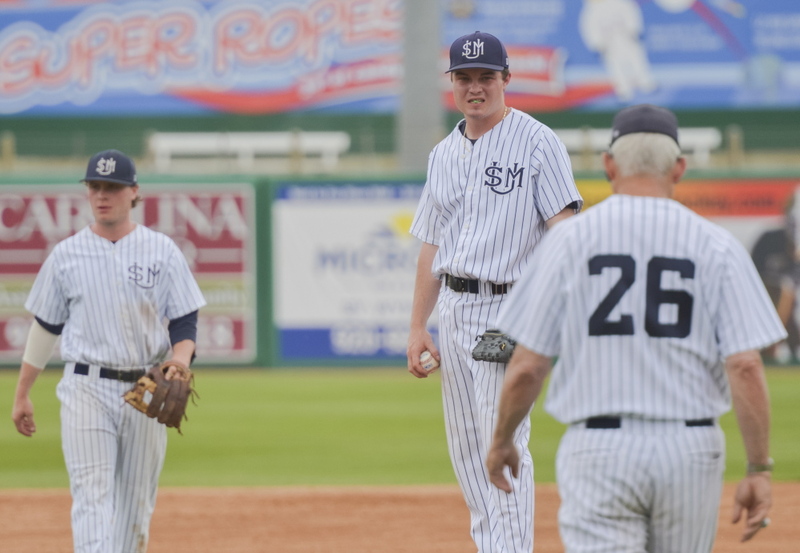 University of Southern Maine pitcher Alex Tobey waits on the mound for Coach Ed Flaherty during the fifth inning. Tobey was replaced by Andrew Richards. USM’s Chris Bernard hits a run scoring single in the eighth inning of the Huskies’ 15-3 loss to Emory on Monday. Emory scored four runs in the first inning to take control, then relied on the pitching of 7-foot sophomore Paul Merolla to shut down a Huskies offense that had produced 17 runs in the last two games. Flaherty knew what the Eagles from Atlanta were capable of doing offensively, especially early in games. The four runs they got against the Huskies gave them 14 first-inning runs in the tournament. But Flaherty and the Huskies, who finished 37-15, were still confident they could overcome that deficit. USM had come from behind each of the last two days to stave off elimination, each time using a big fifth inning to take the lead. 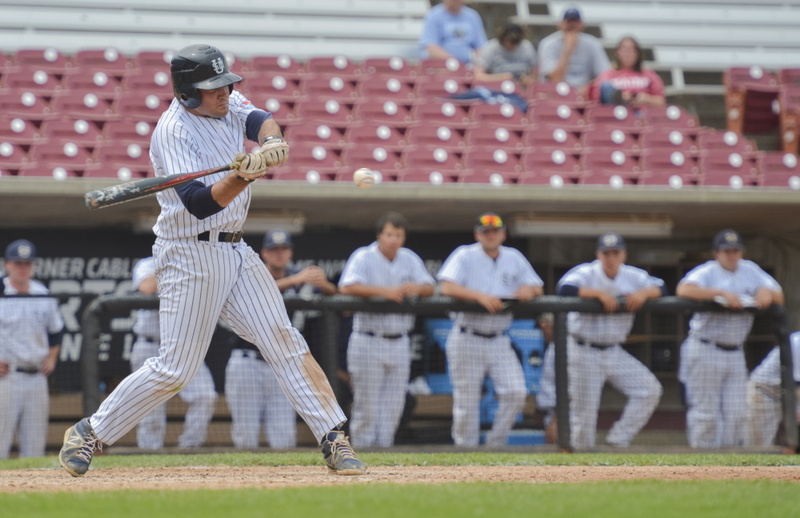 On Monday, the Huskies had their best chance to come back in the third inning. Paul McDonough and John Carey led off with singles and Dexter walked to load the bases. Up came Forrest Chadwick, USM’s most dangerous hitter in the tournament. He was hit by a pitch on a 2-2 count, forcing in a run and reloading the bases. Senior catcher Matt Verrier then laced a line drive up the middle — right to Emory second baseman Jared Kahn. He snared it, then stepped on second for a double play. Chris Bernard (three hits) then singled, making it 4-2, but he was forced at second on a grounder to end that threat. “Four-nothing, we still thought we had a chance,” said Flaherty. “We had a big third inning, would of, could of, had a big inning. Three feet one way or the other, we’ve got a base hit with the bases loaded and a run in already. And that could have changed the game. But that’s baseball. But the Huskies’ bullpen, worn by all the innings thrown in the first three games, simply couldn’t keep the Eagles down. Emory got single runs in the fifth and sixth innings to regain the four-run margin, then put the game away with a five-run seventh. Merolla — who played high school ice hockey — effectively contained the Huskies, especially with an over-the-head curve. He needed only 99 pitches for the complete-game win, throwing 66 for strikes. But Chadwick was more impressed with Emory’s defense. That included in the field. Emory’s four-run first inning wasn’t overpowering. Leadoff batter Wes Peacock blooped a single to right and then stole second. He went to third on a single up the middle by Brandon Hannon. Then Peacock scored when Brett Lake hit a dribbler that went about 15 feet in front of home. Following a sacrifice bunt, Kahn hit a two-run double — a smash down the third-base line that deflected off a diving Thibodeau’s glove into short left field. That was it for starter Shyler Scates, who was replaced by Alex Tobey. Kahn stole third and scored on a sacrifice fly by Jared Welch to make it 4-0.